In this exciting clay class we will explore a variety of throwing and hand-building techniques and their relationship to the creation of personal functional forms. We will explore the subtleties of everyday pots: how do they communicate in tactile, visual, functional, and spiritual ways? We will use simple ideas of altering, using multiple sections, and adding texture to create line, volume, and scale. Participants will be encouraged to consider how these components reflect the maker¹s identity. Bisque firing only. Any personal tools you enjoy using. *Items marked with an asterisk are available at the Shakerag store. Jan McKeachie Johnston studied at The University of Minnesota and Southern Illinois University, and received a BFA from The University of Wisconsin at River Falls. Since 1979 she has been a studio artist and very active demonstrating and teaching workshops at universities and arts and craft schools around the United States and in Chile. For the past 20 years she has participated in important exhibitions throughout the United States and Japan. Jan is represented by Lacoste Gallery (Concord, MA), TRAX Gallery (Berkeley, CA), and Northern Clay Center (Minneapolis, MN). Her work has been featured in Ceramics Monthly, Ceramics Art and Perception, and Clay Times, and her work is represented in many private and public collections including the Chrysler Museum (Norfolk, VA), the Weisman Museum at the University of Minnesota, and the Minneapolis Institute of Art. I have worked as a studio potter/ceramic artist for more than twenty-five years. 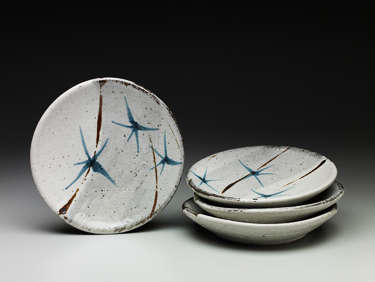 My work grows out of a strong tradition of functional ceramics from England and Japan (Leach/Hamada). Over the years it has also been informed and inspired by the ancient Minoan pottery of Crete, Jomon pottery of Japan, American Indian and Japanese basket forms, Iranian pottery, and many aspects of African art, including pottery and masks. My interest in these cultures and their art is the strong sense of form, rich surface pattern and texture, and a universally understood connection between humanity and art, elements which I am concerned with in my own work. I fire the majority of my work in two Japanese style wood fired kilns. The duration of the firings are 3-5 days depending on the kiln being fired. It is a process during which wood is continually stoked into the kiln. The accumulation of ash on the surface of the pieces enhances the surface textures and subtleties of form that I consider critical to the qualities I am trying to communicate. Working within a traditional framework, it is important to me that my work moves beyond that framework to carry information personal to myself to the viewer/user. Each piece is considered as an individual. I approach my work intuitively, finding that while I have certain ideas or parameters about form and finished product, it is essential to the vitality of the piece to remain open and maintain a dialogue during the creating process. Through this process I hope to reveal the unique, friendly and responsive, and robust qualities of clay as a material. My intent is that these pieces stand alone as visual objects. My hope is that they move beyond that to express emotional, sensual, tactile, spiritual, and ritual sensibilities—these sensibilities being enhanced by the communication and sharing that occurs through use.